Below is a brief history of the Crabbet arabian. A definition of “Pure Crabbet” is here. Some say the Blunts arrived just in time as the great desert breeding programs were diminishing. Lady Anne had a very critical eye for conformation and chose only the horses she considered the best suited for riding and racing. These horses brought from the desert (read more about these horses in Peter Upton’s book “The Arab Horse”) meant that Crabbet became the center of Arabian horse breeding. At least 90% of all Arabian horses alive today trace their pedigrees in one or more lines to Crabbet horses such as Mesaoud andSkowronek. 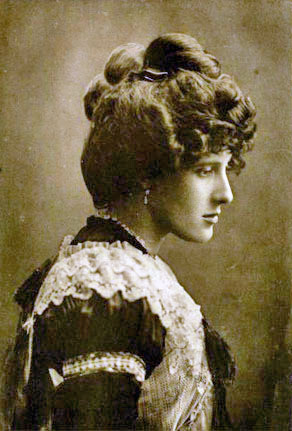 Following the separation of Lady Anne and Wilfrid in 1906, the stud was divided. She kept Crabbet Park and half the horses, while Blunt took Caxtons Farm, also known as Newbuildings, and the rest of the stock. Soon thereafter, Lady Anne retired to her Sheykh Obeyd stud in Cairo, where she lived for most of the remainder of her life. Wilfrid frequently had to sell off horses to pay off debts. Lady Anne died in 1917, passing on her titles to her only child, Judith, who became known as “Lady Wentworth.” The Wentworth title, one of the oldest in England, is one of the few that can be passed through the female line. The Crabbet estate went to Lady Anne’s granddaughters, Anne and Winifred, as did what horses she still owned in England. Lady Wentworth had already bought back some animals that Wilfred had sold to third parties and thus had a small herd of her own. Wilfrid then attempted to seize the horses and land, making a nighttime raid on Crabbet and initially taking all of the horses, including those already legally owned by Lady Wentworth. The mare Bukra, too near foaling to travel, was shot on Wilfred’s orders. For the average Arabian horse owner, horses with Crabbet ancestry are noted for athletic ability, attractive appearance, and good dispositions. They are popular in under saddle classes and seen in many equestrian disciplines. Bitter and anxious to pay off his creditors, Wilfrid sold 37 horses, exporting several to W.R. Brown’s Maynesboro stud in the United States. Between thefts and sales of horses at Newbuildings, many horses of the original Blunt breeding program were lost to Crabbet. In turn, Lady Wentworth and her children forcibly took her favorite mare, Riyala, from Wilfrid’s stable, and purchased back many horses from their new owners. A protracted lawsuit ensued between Wilfred against both his granddaughter’s trustee and his daughter. Eventually the courts ruled against Wilfred. At one point, after Wilfred had shot seven more horses, the Trustee for the granddaughters obtained an injunction to prevent the sale or destruction of any more animals. In 1921, the court declared that Wilfrid’s seizure of horses was illegal, and that even the Deed of Partition was invalid, having been signed by Lady Anne “under duress”. Lady Wentworth was able to buy out her granddaughter’s share in the estate from the Trustee, who was anxious to liquidate the assets. Upon Wilfrid’s death in 1922, Lady Wentworth also bought Caxtons Farm from his executors and finally reunited the entire stud. By the time Lady Wentworth took over the Stud, Crabbet Park had been leased. The Stud itself retained only eight horse boxes, some cowsheds and a few weed-choked pastures. The horses had been sorely neglected, some had starved to death, and others took years to recover. Lady Wentworth spent many years carefully rebuilding her stock and refining her breeding practices. To raise funds, she sold some bloodstock back to Egypt in 1920, including the stallions Kasmeyn, Sotamm, and Hamran, as well as the mares Bint Riyala and Bint Rissala. She also sold a number of horses to Spain’s Duke of Veragua, including five Skowronek daughters. In 1926, she again received a significant infusion of much-needed cash when the famed Kellogg Arabian Ranch in California, owned by breakfast cereal magnate W. K. Kellogg, spent over $80,000 to purchase severalCrabbet horses. 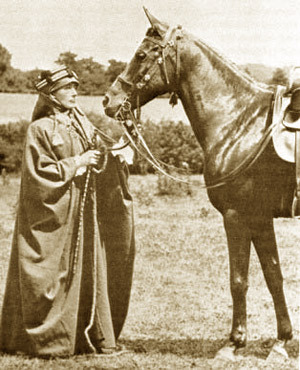 Lady Wentworth rejected Wilfred’s “desert conditions” theory as well as a prevailing conviction that Arabians were naturally the size of large ponies (that is, under 14.2 hands, or 58 inches high at the shoulder). She first proved that Arabians could produce taller horses from the progeny of Rijm, a grandson of Rodania, who reached 16.1 hands. Her great contribution to Arabian breeding, however, was her outcross of the Blunt bloodstock to Skowronek. Lady Wentworth knew that she needed additional horses to outcross on descendants of her parents’ original bloodstock. Therefore, she added the chestnut stallion Dargee, and her most famous purchase, Skowronek. The English painter Walter Winans bought Skowronek from Count Josef Potocki’s Antoniny Stud in Poland, where he had been foaled in 1909. 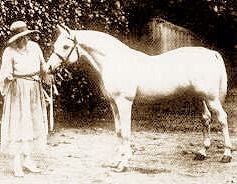 Winans rode the stallion and used him as a model for several bronzes, then sold him to Webb Wares, who used him as a hack, and eventually sold him to H.V. Musgrave Clark, where he was shown and used at stud for the first time, coming to the attention of Lady Wentworth. While Count Potocki apparently found Skowronek unimpressive as a colt, having sold him to Winans for £150, the gray became a spectacular stallion and was named “Horse of the Century”. Lady Wentworth later turned down an offer of $250,000 from Russia’s Tersk Stud, and bragged that she once received a cable “from the Antipodes” addressed to “Skowronek, England.” The outcross of the Crabbet stock with Skowronek was extremely successful, and the resulting animals not only sold throughout England but were exported to Argentina, Australia, Canada, Chile, Denmark, Egypt, France, Germany, Israel, the Netherlands, New Zealand, Pakistan, Poland, South Africa, Spain, Russia and the USA. Crabbet’s peak year was 1929, when over 30 mares were bred. But as the Great Depression deepened, it affected Crabbet Park, with Lady Wentworth only breeding 8 foals in 1932, and 2 foals in 1933. To reduce the size of the herd, she made major sales in 1936 to the Tersk Stud, selling 25 horses, including the beautiful Skowronek son Naseem. The stud’s financial picture also improved by selling 3 more horses to the Kellogg Ranch. In this period, Lady Wentworth also sold horses to Australia, Brazil, Holland and Portugal.Nonetheless, the Depression years resulted in the birth of many fine horses, including Sharima, Indian Gold, Indian Crown, and Sharfina. During World War II, Lady Wentworth’s aunt, Mary Lovelace, died, leaving a large fortune. This inheritance was much needed and marked the end of the financial problems which had been a problem for Lady Wentworth and the Crabbet Stud. In the war years, even though Lady Wentworth cut back her herd due to shortages and the necessity for the Stud to be completely self-supporting in horse feedstuffs, horses such as Grey Royal, Silver Gilt, Indian Magic, Silfina, and *Serafina were produced. While Crabbet was bombed during the war, with over 32 incendiaries dropped, all landed on farmland and no humans or horses were injured. A Canadian Army Supply Unit took over part of the stud, with soldiers billeted in the house and even in some of the horse boxes. After the war, she purchased the stallions Raktha and Oran, and produced other significant breeding stock including Sharima, Silver Fire, Indian Gold, and Nisreen. By the time of her death in 1957 at the age of 84, she owned 75 horses, noted for their height, excellent movement and regal carriage. Among Lady Wentworth’s books are two major works: Thoroughbred Racing Stock and its Ancestors (1938), and The Authentic Arabian Horse and His Descendants (1945). Fortunately, Cecil Covey had inherited some other land. Only by selling land and nearly half of the 75 horses was he able to pay the 80% death duties owed on Lady Wentworth’s estate and keep the stud going. What followed was the largest single consignment of Arabians ever made from England, to Mrs Bazy Tankersley’s Al Marah Stud in the USA. In 1961 Covey also sold the stallion Sindh to Dora Maclean of Fenwick Stud in Australia, where he became one of Australia’s most important Arabian sires. For 12 years the stud ran smoothly under Covey, with 20 to 30 horses plus visiting mares; for the first time, the Crabbet sires were open to outside breeders. In early 1970, however, Covey learned that the government planned to build a motorway connecting South London with Gatwick Airport and Brighton. The motorway eventually bisected Crabbet Park, and, having lost most of the horse pastures to development, in 1972 Covey reluctantly sold off the last of the stud. Many major Arabian sires worldwide show a strong Crabbet influence in their bloodlines. Polish and Russian bloodlines have a Crabbet influence through the Skowronek son and Mesaoud grandson Naseem, and his son Negatiw (or Negativ). Mesaoud himself was sold to Russia in 1903. Spanish bloodlines have a Crabbet influence through the stallion Nana Sahib and others. Even major historic “Egyptian-bred” sires such as Nazeer trace to Mesaoud through his Crabbet-bred grandson, Sotamm. The Crabbet-owned stallion Raktha, sire of Serafix, was exported to South Africa in 1951, along with several other Crabbet horses. The first Crabbet stallion imported to Australia was Rafyk, who was imported, along with two Crabbet mares, in 1891. Today, Australia now has a significant number of “pure” Crabbet lines, undiluted by infusions from other sources, with possibly the highest percentage of straight-and high-percentage Crabbet blood in the world. 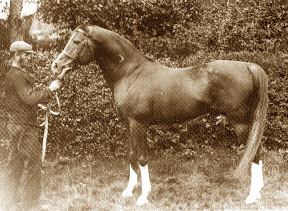 Mesaoud, one of the foundation sires of the Crabbet Arabian Stud, bred in Egypt by Ali Pasha Sherif, imported to England by the Blunts in 1891. A small number of Arabian horse breeders continue to produce preservation or “straight” Crabbet bloodlines, with all animals produced descending in every line from horses bred or purchased by the Crabbet stud. An even smaller group of breeders maintain preservation bloodlines tracing strictly to the horses imported or bred by the Blunts. For the average Arabian horse owner, horses with Crabbet ancestry are noted for athletic ability, attractive appearance, and good dispositions. They are popular in under saddle classes and seen in many equestrian disciplines, both those limited to Arabians and those open to all breeds. The particular virtues of Crabbet horses – sound, athletic conformation, good movement, solid temperament and performance ability – show up especially well in under saddle competition, and particularly in the Arabian-dominated field of endurance riding, highlighted by 100-mile competitions such as the Tevis Cup in the USA and the Australian Quilty 100-Mile Endurance Ride. Crabbet breeding is also popular in the sport horse disciplines such as dressage and show jumping. Thus, the modern Arabian of Crabbet ancestry can be seen in the backyard of the single horse owner, on rugged wilderness terrain, or at the highest levels of national performance competition.